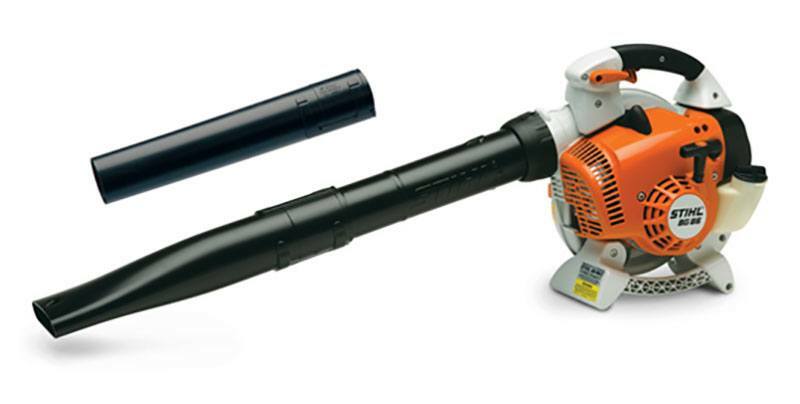 For the toughest landscaping challenges, professionals turn to our most powerful gasoline-powered handheld blower, the STIHL BG 86. It features a fuel-efficient, low-emission gasoline-powered engine, and includes both flat and round nozzle attachments for better job versatility. The blower is also one of our most comfortable to use, with a four-spring anti-vibration system, a soft-grip handle and our ElastoStart™ shock-absorbing starter. THROTTLE TRIGGER LOCK WITH BUILT-IN MOMENTARY STOP SWITCH: The built-in stop switch allows the user to turn off the engine with a simple press of the button or lever. When the engine is off, the throttle lock automatically returns to the “start” setting. Your power tool will be ready to be started when you’re ready to get back to work. SOFT GRIP HANDLE: This handle design provides a secure and comfortable grip. HD2 AIR FILTER: The new HD2 air filter on this unit is washable, providing extremely long filter life and lowering maintenance costs. The large surface area allows for longer run times between cleanings and high performance even while operating in dusty and dry conditions. Overall, the HD2 air filter provides better protection of the engine compared to standard air filters.